How Kernel Office 365 Backup & Restore Software Works? 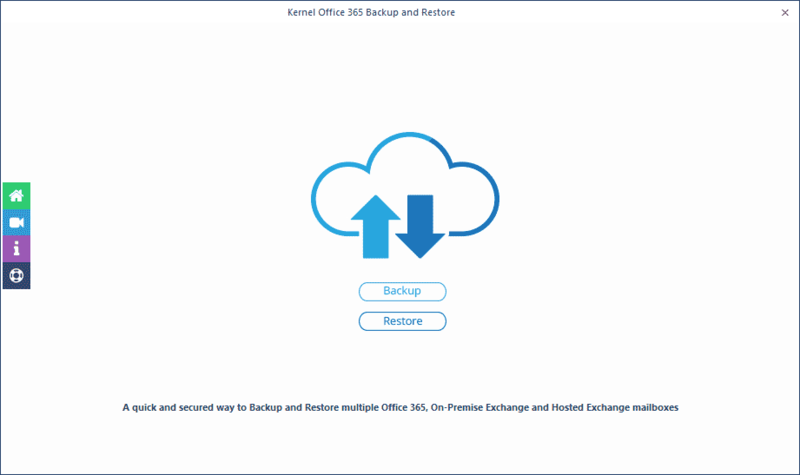 Kernel Office 365 Backup & Restore is an efficient tool to take a secure backup of Office 365 mailboxes in the form of PST file and to restore the PST file to Office 365. The tool is quite simple and easy to use. 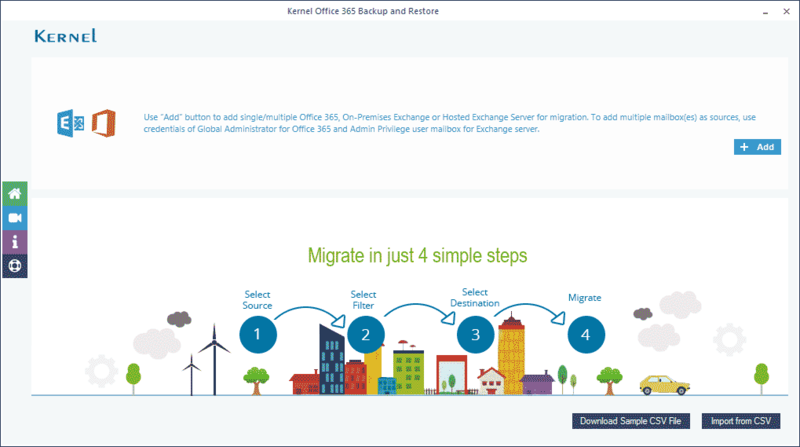 Kernel Office 365 Backup & Restore helps users to securely back up the Office 365 & Exchange mailboxes and to restore them back to Office 365 & Exchange easily. It is useful for both end users and administrators as it works perfectly well with a single as well as multiple mailbox (for backup as well as restore). 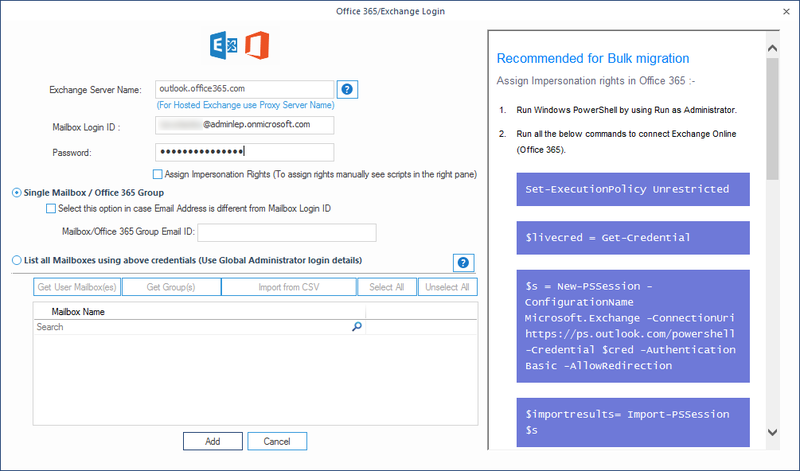 Backup a single Office 365/Exchange mailbox to PST. 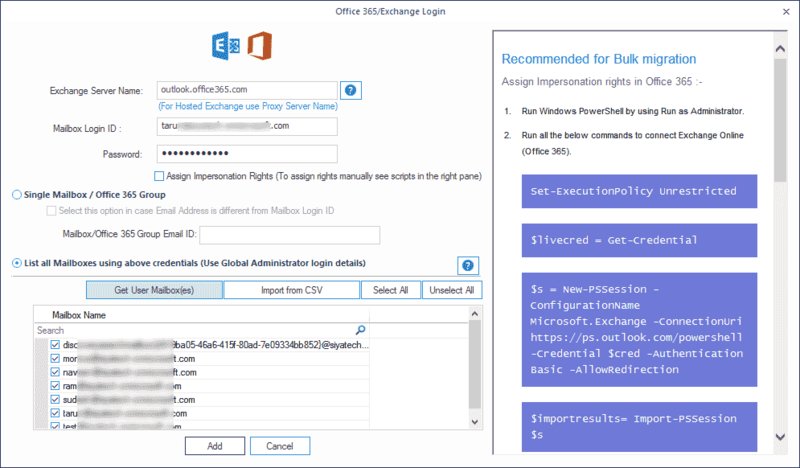 Backup multiple Office 365/Exchange mailboxes to PST. Restore PST file to Office 365/Exchange. 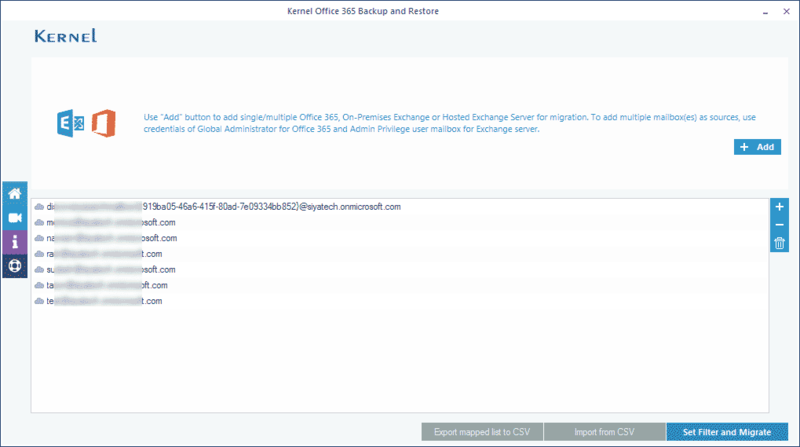 Launch the Kernel Office 365 Backup & Restore application and click Backup. To add a source (Exchange Server/Office 365) for backup, Click the Add button. Note: Also, you can download a CSV file, enter the required details, and then import it to the software. For this, use Download Sample CSV File, and Import from CSV buttons. Office 365 - enter User email & Password. Hosted Exchange Server - enter the login details with Proxy Server name. 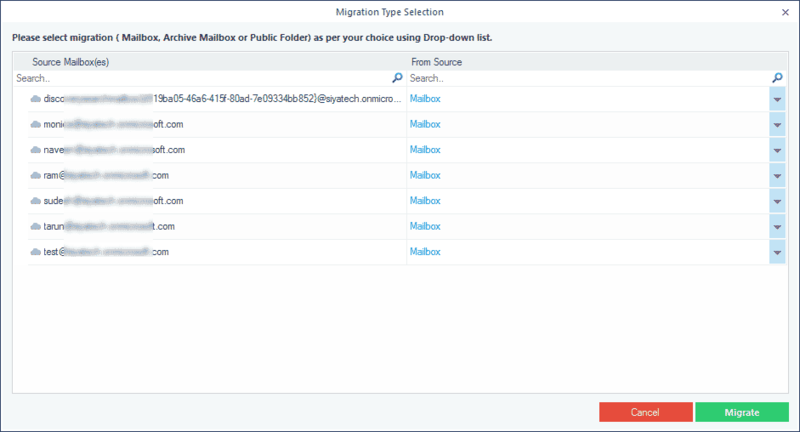 Select Migrate above mentioned mailbox only and then click the Add button. Note – If the email address is different from the Mailbox Login ID (UPN) in the Active Directory, then you need to enter the email address too. Note: You can add hosted Exchange Server by providing the login details with Proxy Server name. However, we are showing the procedure by adding Office 365 as the source. Select the Office 365 account, and click the Set filter and Migrate button. 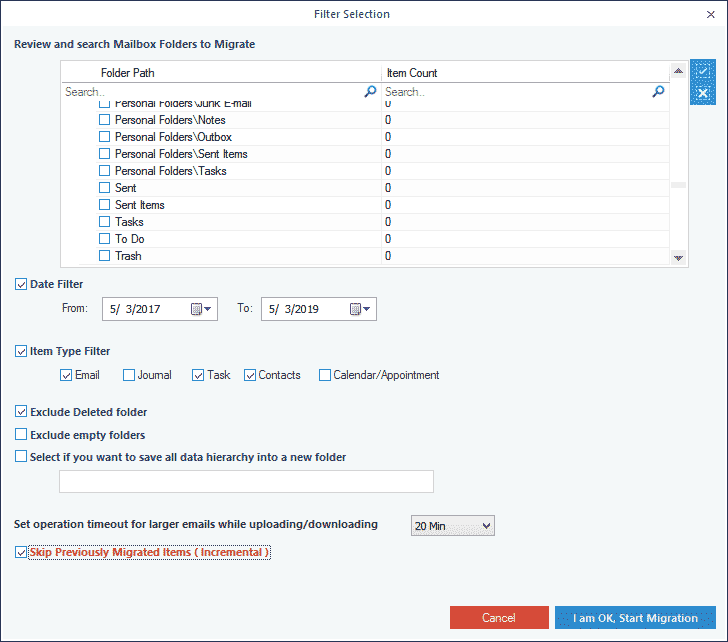 From the drop-down list, select the type of data you want to back up - Mailbox, Archive Mailbox, or Public Folder - then click Migrate. 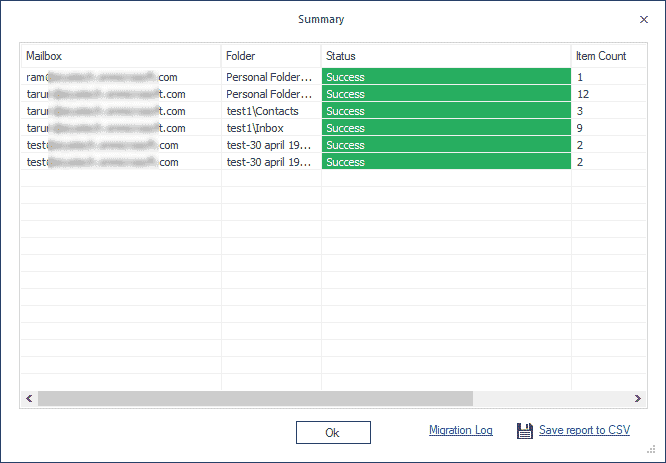 Review and search Mailbox Folders to Migrate – Select the folders to migrate. Date Filter – Provide a date range to filter items. Item Type Filter – Select the item types that are to be migrated. 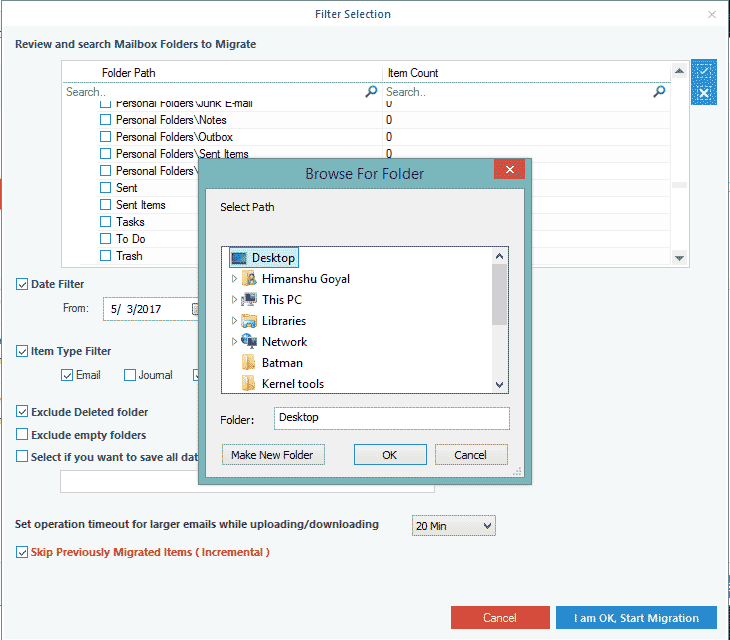 Exclude empty folders – Exclude empty folders from the migration. Set operation timeout for larger emails while uploading/downloading – Select an upper time limit for backup (the backup will be rejected if it exceeds the limit). 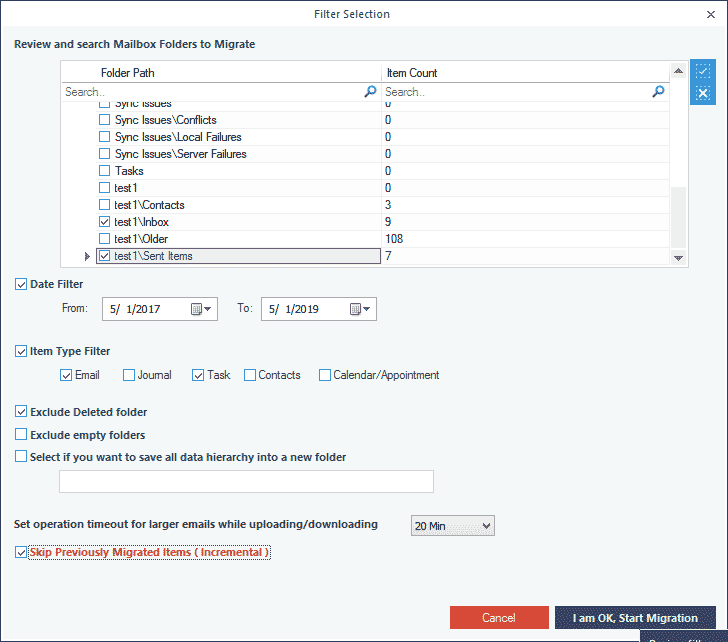 Skip Previously migrated Items (Incremental) – Check the box to exclude the already migrated data and migrate only the additional data. Finally click I am OK, Start Migration. Browse the location for the backup. The tool starts to migrate. You can view the status of the migration on the Summary dialogue box. 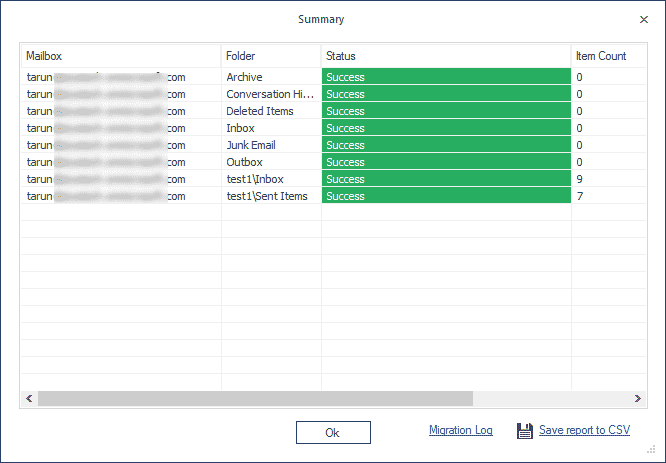 As soon as the migration gets completed, a message window informs that the process is complete. Note: To get the details of backup, click Migration Log. 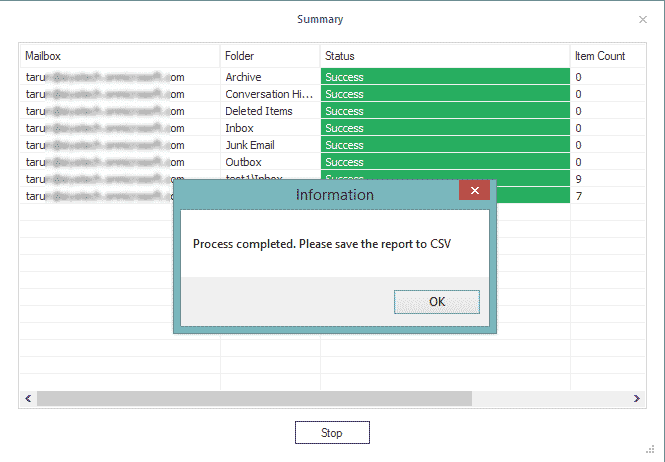 To save the migration report, click Save report to CSV. 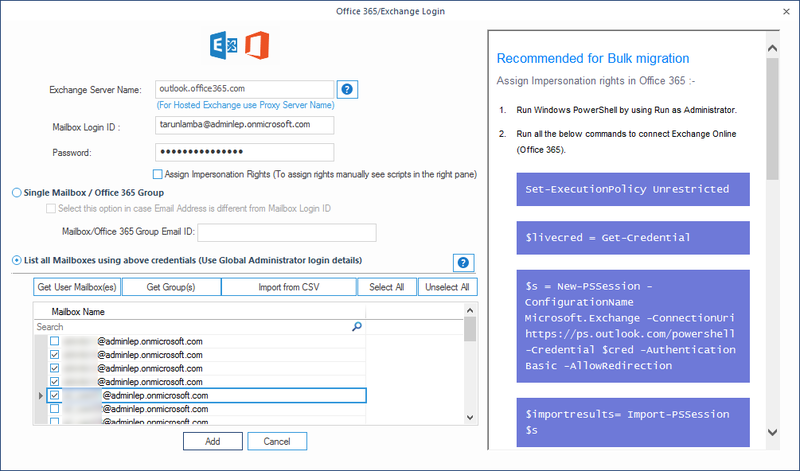 To take the backup of multiple Office 365/Exchange mailboxes, you need to have an Office 365 account with administrative privileges. 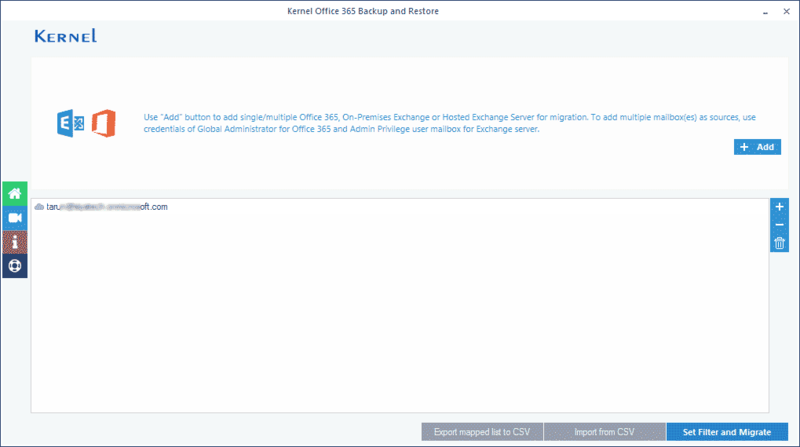 Launch the Kernel Office 365 Backup & Restore application and click the Backup button. 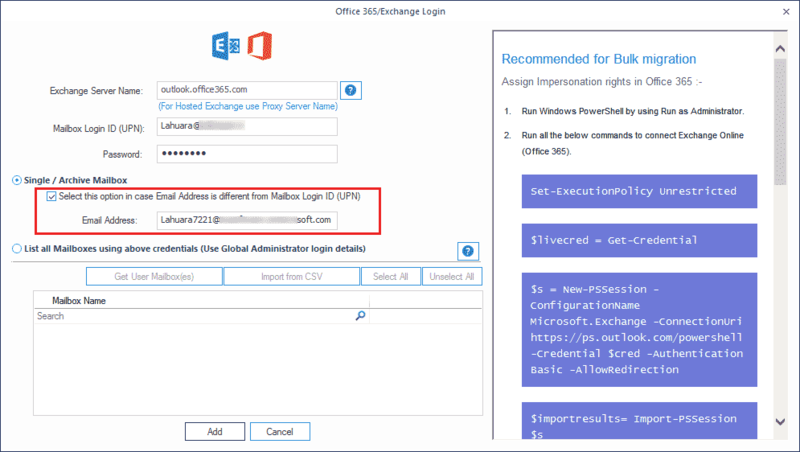 Enter the Administrator (for Exchange/Office 365) account credentials, select the option List All Mailboxes using above credentials, then click Get User Mailbox (es). When the mailboxes are displayed, select the required mailboxes. Finally, click the Add button. Note: You can add Office 365, Hosted Exchange Server, or On-Premise Exchange details as per your requirement. 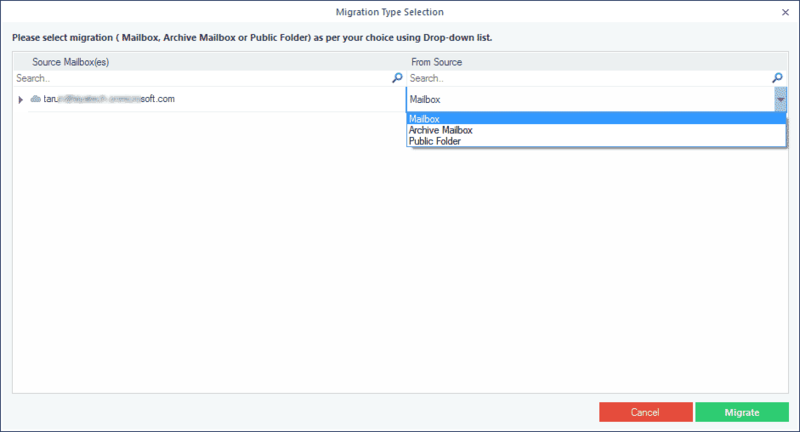 Select the desired option - Mailbox, Archive Mailbox, or Public Folder - for migration and click Migrate. Set operation timeout for larger emails while uploading/downloading – Select a time limit for backup (backup will be rejected if it exceeds this time limit). Provide a destination where you want to save the backup PST file. The backup process starts. You can view the status in the Summary dialogue box. As soon as the backup process gets completed, the tool provides information that the process is completed. Click OK to finish the process. Note: You can see the details of backup by clicking Migration Log. 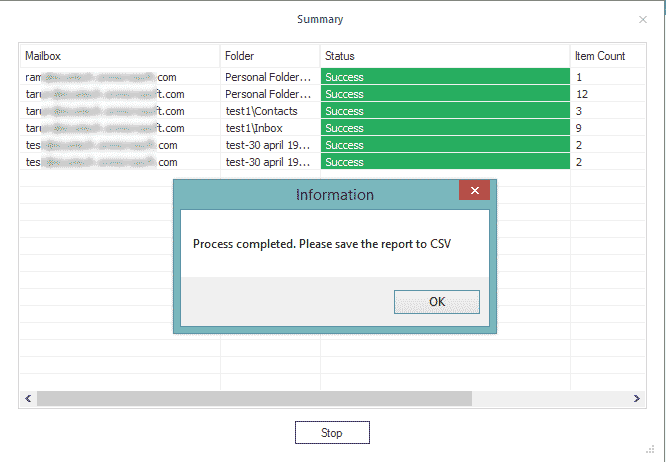 To save the CSV report that has complete information about the total mailboxes backup, click Save report to CSV. Office 365 mailboxes are stored in separate PST files on the specified destination.